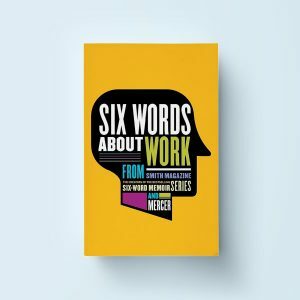 Perfect for your next company meeting or retreat, the latest installment of the bestselling Six-Word Memoir® series offers more than 400 passionate ways at looking at work today. Here’s what the media is saying about Six Words About Work. Talk of the Nation talks to SMITH editor Larry Smith about the “Six Words About Work” challenge. The UK’s Financial Times challenges its readers to take SMITH Mag’s Six-Word Work challenge. Fortune: Talk about getting straight to the point. Most of us could write a book when asked what we do for a living and how we feel about it. But if you were to boil it all down to six words, what would you say?